BE A PART OF MAZZO’S RECIPE CLUB HERE – THE BEST RECIPE CLUB ON THE PLANET! Below is my book “SECRET INGREDIENTS” which is Free for a limited time as a GIFT! Club Members never have pay for the things they want! There are now 2 great clubs offering goodies. COOKING: Tips, tricks and an occasional recipe sent to your email, that may not be in the books or on the website. ALERTS: When new cookbooks are available to the public. 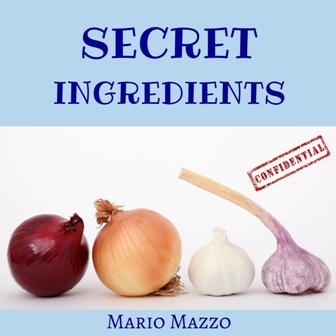 MY FREE MINI BOOK: Called Secret Ingredients. NOTIFICATIONS: Of recipe improvements or when important parts of recipes in the cookbooks are edited. TYPO NOTIFICATIONS: If there’s ever a serious typo that you should know about, found in any of the cookbooks. SPECIAL HELP: Get special treatment from me by email, if you ever need a little extra help with your cooking. SO PAY IT FORWARD, if you like our club, recipes or cookbooks tell others so they can get hooked up too. No Catches – We just want loyal members to spread the word of our great recipes. No Spam – We hate spam and will NEVER give or sell your info to anyone. No Pressure – Don’t ever feel compelled to buy anything. Mario is cool. No Commitments – You can always cancel anytime you like. WHATCHA WAITING FOR? – GET THE BOOK NOW FREE!